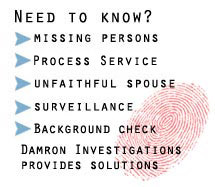 Damron Investigations offers excellent customer service and fast results for all of your investigative needs. Michigan's premiere investigation agency.With over 25+ years of experience in every aspect of investigation -- we will deliver the results you need. From the simplest bit of information, to the most complicated missing persons case, Damron Investigations delivers. When you need to know. When you need information, background checks or any investigation completed quickly & throroughly; contact Damron Investigations. At Damron Investigations, expertise, technology & customer service come together to ensure the best results for you. "Call Damron Investigations when you need results"
Damron Investigations is a full service Private Investigation firm. 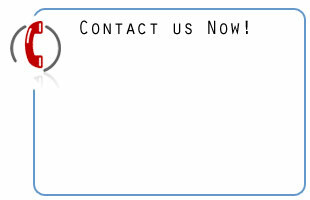 We offer a comprehensive list of services to meet your every need. Professionalism, discretion and accuracy of information is our priority. We are dedicated to providing all of our clients a thorough & timely investigation. We are fully licensed & insured in the State of Michigan. The world is changing, the news is ripe with scary, but real stories of fraud, deception, cheating spouses, identity theft, fraud...and many more topics. Information is the most powerful tool you can have! Make the right decision, armed with accurate information! Getting married? Get his/her background! Worried that your spouse is cheating? Get the info! Need to hire an employee? Let us check their background! Need to retrieve data from a hard drive? We can do it! Want to find a missing person? We can help! Damron Investigation is a full service private investigation firm located in South Eastern Michigan. With over 25 years of professional investigation experience, and comprehensive list of services, when you have a need for an investigator -- call Jim Damron.